Welcome to the pet portrait of Tobey! 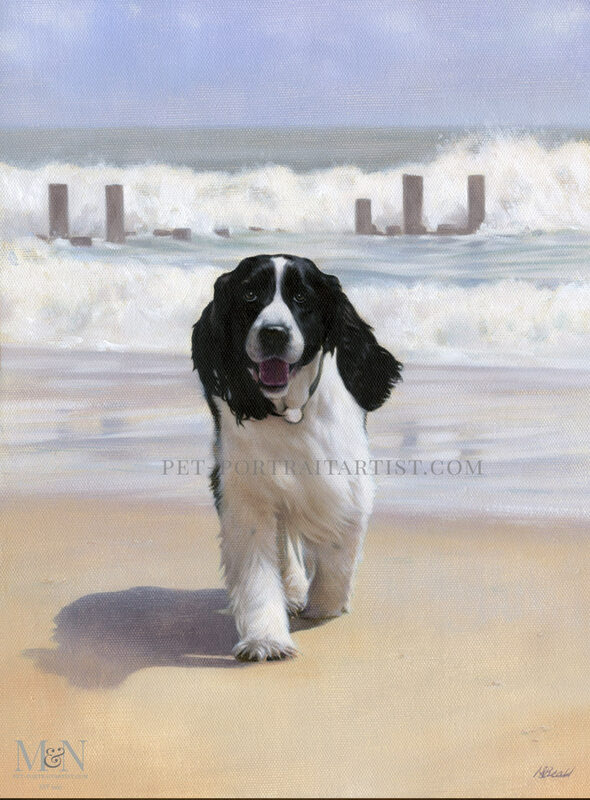 Chuck and his wife Gaye wanted a portrait of their beautiful spaniel called Tobey. Chuck actually called us while we were in our car on errands, and he was at a stop light also in his car travelling near his home in the USA. We had a brief chat on the phone and then when Chuck returned home he emailed us photos of Tobey. 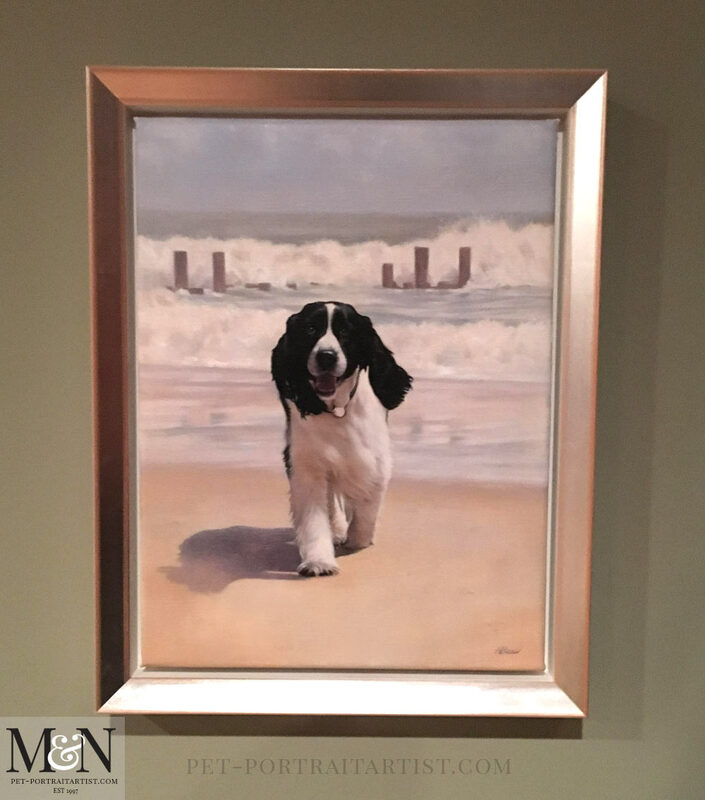 They only had a few photos of Tobey however their favourite of Tobey on the beach when he was younger, their favourite was just good enough to paint from. The portrait is 16 x 12 which was traditionally hand painted oil on Italian Linen canvas by Nicholas Beall. The painting was a fantastic one to create and we have had many wonderful comments about it since it has been painted. We love Tobeys smile and the way he is interacting with the viewer by looking right at us. I also love the way that Nicholas has painted the background, he has kept it fairly light behind Tobey allowing him to be centre of attention. The beautiful colour of the sand in the foreground which really warms the painting is perfect. We received a photo of Tobey’s painting framed and are thrilled to show it on our blog. Our clients also emailed a wonderful testimonial which you can read below too. The portrait was framed by Chuck and Gaye’s local framer. We love it. The gold and bronze tones enhance Tobey’s painting well. There were some very pretty warm sandy colours within the painting and consequently it all ties in together nicely. I have already added the framed portrait and the testimonial to our dog pet portraits testimonials page. If you are reading our blog and have been a client of ours in the past, we would love to see your portrait displayed in situ. We would really love to see them and add them here on our blog! Email us at any time. We are VERY happy with our Tobey portrait….Nicholas’ talent has given us the chance to see him in our home at all times and maintain so many wonderful memories. We are very happy with our frame, selected with the help of Gaye favorite gallery owner in Annapolis. Thank you again. Our best wishes to you and Nicholas for a wonderful Christmas season and many blessings in 2018.